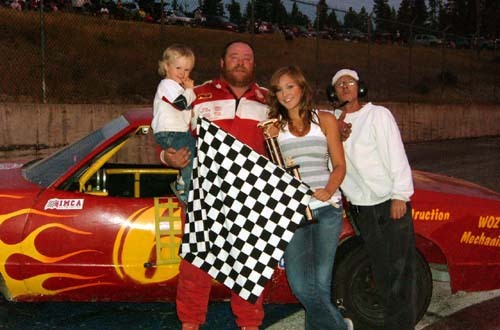 Well the 2006 season in on the go with a great list of sponsors including East Kootenay Land Corporation, Brandt Tractor, Mitchell Excavating, Shoesmith Construction, Mountain Petroleum, Stratton Plumbing,WOZ Mechanical, Fernie Auto Parts,Fernie Dominos, Chris'R.V.,and others. The crew has been awesome with a great looking car and a first and second place finishes in the first two races,one on dirt in Lethbridge and one on pavement in Cranbrook. Thank you to Marty Garrett,Gene Stephenson,Darryl Gilles, Don(The Don)Elmer, Ken(Brock)Bracconier, J.D. and Josh Danforth(the father/son painters),and a special thanks to my wife,Jeri, my daughter,Lacey, and my son Cliff as well as All about M.E. racing and T.R's possum lodge. The car is an 1980 Malibu with a Monte Carlo nose piece. The engine is a 350 from JR Motorsports in Iowa with a four speed transmission. Painted the same color as last year but with flames. First time on dirt at Lethbridge, Bridge County Raceway terrible in the heat races track dried up for main and I finished second, then I think the excitement got to me and I forgot to go to the tech area.... ended up getting disqualified. Well after missing three races because of rain we finally got to race in Cranbrook.. It was the Baby Grands,Fathers day race and We didn't do great. Qualified second and finished both heat races in third but due to an accident and having to slam on the brakes we lost them for the main and barely pulled out a top ten. Mike #45 finished second to Terry #81 and Cliff #77 finished right behind me. Well the day started rough and kept that way all night. Got new tires but they were the wrong size and a different tread which we could not get to grip ordered new dunlops for next race. Never made the trophy dash, spun out in a heat race and then in the main I was able to drive it like a dirt track car,sliding around the corners, I was able to finish third but mainly cause Mike #45 blew up his engine Then Marty went out for the pitmans race and was able to win. Might have to let him try a main sometime. Super trucks raced today pretty good show. We were not so lucky. won the heat race very easy. Then first lap in the main I was taken out by a female rookie she hap spun at the top of the track so I followed Trevor to the bottom of the track but she backed down and hit the rear of the car, which bvroke our axel putting us out of the race. Mike finished third and Cliff finished fouth. Lethbridge racing today was on a wet track with no rear brakes for the first race which we finished near the back. Then I got a 2nd place finish in heat two. The main started with a salute to the crowd by doing a 4 car wide lap and then fall back into place and race. Raced real hard and even though contact with the front wall a couple of times we finished fourth. Went thru tech and everthing was good. The sprint cars put on a great show. Wednesday nite race perfect night not bad crowd and some good racing. We had some bad brake problems and had to fight the car all night. Finished behind Terry all night but atleast made him work for the wins. TYapped him a few times and got a warning then I tapped Mike ,just to show I got no prejuduces about who I hit. Cliff finished the main in second place right behind Trevor #28. He is racing really good this year and now he got rid of his big blue balls so hope he is good for the rest of the year. Racing was in Lethbridge this week with the imca modifieds and truck stocks and claimers There were 13 of the imca stockcars so it was a real good show. The #66 malibu had a very hard day. In the first heat we had a sparkplug wire fall off and finished at the back, in the second race a plug wire got burnt thru and finished in the back again. With these problems fixed and a loaner tire from Calvin #11 we took the white flag in fourth place then another driver Larry #24 came down on the right front flattening the tire,(one of the new ones ofcourse) the next corner I went to the outside to let him by and he rammed me and tried to shove me into the wall. I was able to stop from hitting but when I tried to chase him down on a flat tire I slid into the other corner wall. Minor damage on the front but a lot of wreckage in the rear. Ohwell we have to be ready for Wednesday in Cranbrook it is a race sponsored by Alpine Trails one of our major sponsors.By the end of Sunday we had the car switched over and most of the repairs done new paint and setup we will be ready. Well another wednesday night race that turned out awesome. It started out with Mike#45 beating me at the line for the fast trophy dash then in the first heat I raced Cliff #77 hard and took the win. In the second heat I got stuck behind John#24 and ended up in fourth. Cliff won that heat race and Terry#81 finished right ahead of me. We started the main with 14 cars and Terry and I in the second to back row. I was able to avoid a few wrecks and got to the front before halfway. Cliff and I raced side by side for a bunch of laps then when Terry caught up we split up and after racing hard with him I was able to use lapped traffic to get away. Cliff got back into second and we raced hard for the win. My car was set up very well and I was able to get away from him and win the main event.Cliff finished second, Mike finished third. It was a great finish for the Red Rabbit Race Team. One of our main sponsors,Pat Cherak from East Kootenay Land Corporation(alpine trails) was there to watch the race that he sponsored along with Mike Contini and his daughter Meghann,who was the trophy girl and also sang the national Anthem, and lots of our regular and new fans from here to Calgary including my sister Kelly and Terry and Colby. 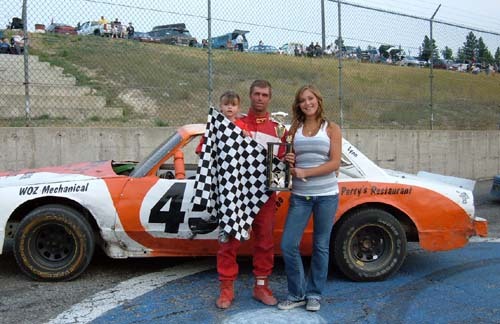 We raced in Lethbridge on this Saturday night and had an ok night. Finishing second in the first heat after leading the whole race and Calvin#11 passes me on the line. The second heat we could not get going very fast and ended up finishing fourth. The main started with a beautiful four wide,salute to the fans lap. Then when the racing started I fell right to the back,but the car slowly came to me and with a lot of passing on the inside I was able to come up and finish fourth. There is a little bit of damage but other than that we can get the car ready for this saturdays race in Cranbrook. Well when we get a car ready we do it right We were the fast qualifier tonight with an 18 sec run the first in hobby stock class. Only won one heat race but I finished second in the main after starting last, could not get past Trevor #28 but i know i was faster than him I had to brake hard in every corner to keep from spinning him out. The car was too loose to drive around the outside but Terry #81 finished fourth so Maybe we still have a chance to catch him Hopefully he wins tickets to Hawaii and misses a race I would only get enough points to tie him and then we could race for the championship at the next race,High dreamw hey Terry. In the pitmans race Don Elmer ran my car against J.D in Mikes car, Josh in Cliffs car, Trevors son in car #28 and also car #23 Don played it cool for the first half then he started to make his move he passed #23 and then while passing #45 they got together and We ended up with a broken axel,wrecked body and a cool looking fire,maybe not from Dons view,Exhaust fire, blue flames and went out when the car started. He will be working hard this week. 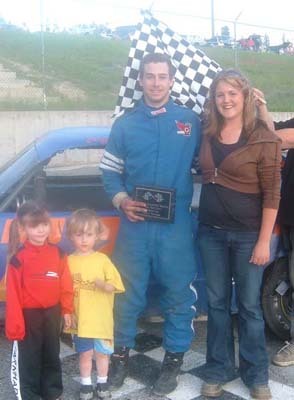 Sept 3 2006 Labour day weekend is always the Lions Demolition Derby and Red Rabbit Racing was a big part in it. The main was won by my crewchief Marty Garrett and his car also won the powderpuff event with Lynette Hutchinson driving. The trucks I won but there was a rookie girl in a van that was still running just could not move so I split first place money with her, hope she will be back in next year. Josh had done a awsome job on the paintwork with Jeri doing the final touches. The truck we put in the derby is dedicated to all our sponsors and fans that support Red Rabbit Racing,But most of all it is my thanks to a great crew that works for both on and off the track. They have fixed us time after time when other racers would have been parked. The heat we were in was full of excitement with my truck starting on fire in the pits and then again on the track,but it kept on starting right till the last hit. Mike #45 had a four speed ford that broke the clutch right early but he was able to get it to shift and made some great hits, lots of them were on the smashed cars in the middle but so did I . We race this sunday at Cranbrook and next sunday is the final race.Then we will get to go back to Alberta and race in Calgary and High River a few times. Sept 10 2006 Well it was a beautiful day for racing and we were on rails. I qualified second fast and had to start at the back all day. Terry #81 beat me in the trophy dash and then I won all the rest of the races. Cliff had some bad luck with breaking a rocker stud in qualifing,the crew had to pull the intake,replace the lifter,replace the stud and put it together,they had a bit of an oil leak but never missed a race, He was down a couple of laps in the heat race and on the last lap he got into Terrys way and allowed me to win that race,they disqualified him but I don't think it was right.The flagger told him to stay high and Terry should have known he was not going to come down and take me out, a racing thing I guess. I am real worried for him this weekend, Terry has threatened to put him out and that can get dangerous if he goes hunting for him. The heat race was a good one between Mike#45 and I with us going 3 deep into turn 3 and me pulling out ahead of him. We did it a couple of times with John#24 but then he got loose and pushed Mike into the wall but he was able to keep going. In the main Jamie #84 spun out and I ran into the back of him I came into the pits and the crew taped up the nose and fender. We had to start at the back with only half the race left. I was fliing and pretty soon I was right behind Terry for the lead and sure enough Cliff was in the way again. This time on the inside and on the lead lap but Terry did the same thing, pulled up behind him and Trevor#28 and I both went around on the outside, Mike got past him right after and I held Trevor and Mike off for the win. Two good donuts,one on the backstretch for my crew and one up front for the fans. A little complaining after the race but in the end I gained 47 points and now Terry is only 39 points ahead, still a chance to get the championship. This sunday the 17 is the last race so we will see when the smoke clears. Sept 17 2006 Well it turned out to be a great day for racing after going thru snow and rain all week. We ended up with a bad set of tires through out the whole day and ended up qualifing fourth fast,Mike #45 was the fastest,"way to go Mike E", I won the trophy dash from the pole and then won the first heat race. This got us thinking there was a good chance of catching Terry#81,but he beat me in the next heat and after some great racing side by side and behind Monte#02 and John#24 there was a yellow on the rastart I lost my brakes and lost control in turn one,I came right thru the pack cutting down in front of Mike When he hit me two other cars ran into the back of him and some more cars spun what a wreck "sorry"We bent the frame rails at the back of the car but it fixed the brakes. I had to start in the back and ended up hitting the wall three times pushing to hard but I caught Terry and Trevor#28 raced hard with Terry and got by him but the car was used up and I couldn't get by Trevor,Great Racing Guys. My best wishes out to Terry for winning the Championship and for not retaliaiting for last week. We had some good races today even though Cliff#77 blew up his engine before the main he raced very clean and smart. I tried to help Mike by giving him a push but I pushed to hard and he shot off the end of the track,"sorry Mike E". The Cranbrook season is over but I still have some races in Alberta starting Sept 23&24 in Calgary so got to get switched over and rescale to car hopefully it will handle better there. Thanks to all the fans and drivers and track crew we had a great summer racing and it will be nice to be back there again next year. Sept 23 and 24 Well what a weekend we had. The Red Rabbit Racing team loaded up and went to the Imca Super Nationals in Calgary Alberta. We took all three cars and except for Gene the whole crew was there. It was the first time on the track for us and we had some of the best experiences in a while. The end of the weekend was pretty scary with Cliff#79(number change for Imca)blowing his engine at 100 miles per hour going into turn one,spinning in his own oil and backing the car into the wall. It took so long to get him out that they called the race with 3 laps to go and we were sent to the pits,There I got out and stood with Jeri till finally Cliff got out and walked to the ambulance oh what a relief. After they checked him out and they let Jeri go see him, He was released to walk back to his pit on his own. The racing was intense all weekend starting each day with Qualifing then two heat races and a main. 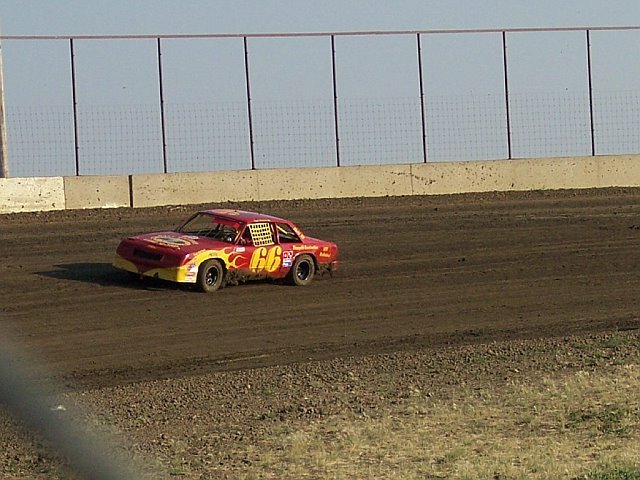 Rick#66 finished third place in three heats and fourth in one, then 5place in saturdays main and fourth on sunday. Over all weekend I ended up Fourth. Cliff finished Fifth overall and Mike #49(number change)finished eighth out of 16 cars. Pretty darn good for our rookie weekend.We all had our own little problems Cliff lost his powersteering saturday, Mike was low on power and pushed to hard and hit the wall qualifing, and I lost my powersteering and my hood flew open on the first practice session on sunday. We got most things fixed and finished each race all weekend. It was a long hard weekend but it was an experience that we can remember for a while. We had some fans there including Uncle Tom and Robert,Kelly,Terry and Colby White, Tridene,Sierra and Connor Elmer even my cousin Danny,Candice,Mckenzie and Zach Staples, after the race I believe we had a lot more fans.